SONOSIM SUMMARY: In this study, physicians with no prior training in ultrasound-guided vascular access (UGVA) received UGVA training with either traditional didactic instruction, or with a Web-based procedural training program. After training was complete, participant UGVA aptitude was accessed. 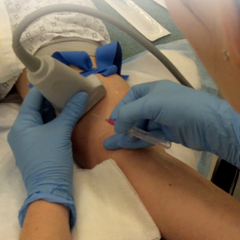 Results showed no significant differences in mean objective structured clinical examination (OSCE) or written test scores, implying that online ultrasound courses are an effective way to learn ultrasound-guided vascular access technique. Chenkin J, Lee S, Huynh T, et. al. Procedures Can Be Learned on the Web: A Randomized Study of Ultrasound-guided Vascular Access Training. Academic Emergency Medicine. 2008 Sept 5;15(10): 949–954. Web-based learning has several potential advantages over lectures, such as anytime–anywhere access, rich multimedia, and nonlinear navigation. While known to be an effective method for learning facts, few studies have examined the effectiveness of Web-based formats for learning procedural skills. The authors sought to determine whether a Web-based tutorial is at least as effective as a didactic lecture for learning ultrasound-guided vascular access (UGVA). Participating staff emergency physicians (EPs) and junior emergency medicine (EM) residents with no UGVA experience completed a precourse test and were randomized to either a Web-based or a didactic group. The Web-based group was instructed to use an online tutorial and the didactic group attended a lecture. Participants then practiced on simulators and live models without any further instruction. Following a rest period, participants completed a four-station objective structured clinical examination (OSCE), a written examination, and a postcourse questionnaire. Examination results were compared using a noninferiority data analysis with a 10% margin of difference. Twenty-one residents and EPs participated in the study. There were no significant differences in mean OSCE scores (absolute difference = −2.8%; 95% confidence interval [CI] = −9.3% to 3.8%) or written test scores (absolute difference = −1.4%; 95% CI = −7.8% to 5.0%) between the Web group and the didactic group. Both groups demonstrated similar improvements in written test scores (26.1% vs. 25.8%; p = 0.95). Ninety-one percent (10/11) of the Web group and 80% (8/10) of the didactic group participants found the teaching format to be effective (p = 0.59). Our Web-based tutorial was at least as effective as a traditional didactic lecture for teaching the knowledge and skills essential for UGVA. Participants expressed high satisfaction with this teaching technology. Web-based teaching may be a useful alternative to didactic teaching for learning procedural skills. To read the complete article, visit the Wiley Online Library by clicking here.